This is a great refresher. I actually didn’t know that doctors, lawyers, etc. could have a listing for each practitioner. That is great to know! Thanks for the feedback, Eric! Yeah, it’s kind of odd that each practitioner can have a listing in addition to the practice as a whole having; it seems unusually UN-draconian for Google, especially in light of the other guidelines. I know you are just talking guidelines and it’s allowed, but FYI to anyone reading – it’s a recipe for a merge disaster. Best practice with multiple locations is a page for each location. Regarding #9. Really? I’ve actually never had a merge problem with the clients of mine who have multiple locations. So is it the case that you’ve found there to be a merge risk even when the only similarities between two locations / GP listings are (1) the business name and (2) the landing page? Either way, thanks for the intel! A little late to this post and do appreciate the info to Q9, however can I get your thoughts on this. I have a home service industry client in Pinellas County FL (pop. 900k+) that lists full page ads in the YP for both directories (south and north). Had full coverage, business was great. He now realizes his YP advertising is fading and has come around to understanding G Places is where to be. But Pinellas County has 24 incorporated cities which cover about 2/3’s of the population and the rest is covered by 10+ census designated places. He has one business address and wants to get listed in all the high populated G Places pages. I understand the merge and unique location pages but …. is the only way for him to get multiple places listings is by having a physical address in each city? If so, I can understand why some businesses try to “cheat” the guidelines. Their market coverage is taking a nosedive. His business address is in Seminole, FL and that represents 2% of the county population. Sure he can get listed on the first page by having a city specific page (as mentioned above) but we all know that the action is a Places listing. I am working with him on a “best practices” option and considering he restructure his business to seek out licensed professionals/employees who actually live in the city and have them set up a Places listing in conjunction with his branded name. Great question. The short answer to it is: your client needs more than one physical location – and more than one Google+Local listing – if he’d like to be visible across all that land. I know it can be tough, but the “ante” in the world of local Google is either (1) having locations more or less in the areas you’d like to be visible in, or (2) forking over for PPC (ideally in combination with an organic and/or local SEO campaign). To make a long story short, I think your “restructuring” proposal is a good one. If your guy has a bunch of people who can use their home addresses, not only is that a Google-compliant solution, but it generally works pretty well. The only other thing I’d add is that having a “city-specific page” IS a good move. As long as it’s not a cookie-cutter page that’s the same as other “city” pages but with different names, then that’s a very effective approach. You may also want to use that as the landing page for your client’s Google+Local listing. 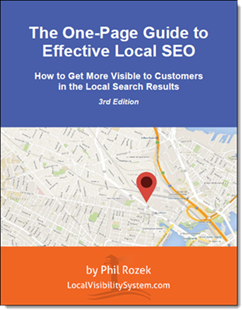 If done right, your client’s Google+Local listing will in a sense be able to “piggyback” off the organic strength of a good city-specific page. Thanks for the quiz, Phil! Some of the checkmarks on the answers seem to be between the numbers. And I have an issue with your answer for number 10. I don’t want to give any answers here, but it looks like the checkmark is on the wrong answer (I’m basing this on where the checkmarks are in the other answers). Can you verify? No problem on the quiz! It was fun to make. Thanks for taking it. Ah yes, woe unto me for formatting the quiz in Word. As you know, it’s just awful for formatting, especially things like pictures. Unless you know something I don’t or have seen something I haven’t, the checkmark is on the right answer. I’m sure you’ve checked out the GP Quality Guidelines recently, but the answer is right there in the “text.” I’ll email you the correct answer for #10 right now, and we can compare notes. Can the lawyers all use the same phone number too? I guess if I can make this sort of quiz more enjoyable than a root canal, I’ll consider it a success. Thanks for the “fun” vote! I’m pretty sure using the same phone number for any two listings is just asking for a big fat merge. As you may know, the phone numbers are treated as unique identifiers. Plus, Google has to draw the line somewhere, or else potentially there would be no limit on how many near-identical listings someone could create under the guise of (supposedly) having one per law. Regarding the lawyer question (number 2), it would appear that if this was done correctly in theory, a firm could fill all 7 Google Places slots on the first page. Do you have an example where a firm/practice (CPA’s, Doctors, Lawyers, or other professionals) occupy several slots on the first page? Just curious as to see what it looks like and verification that it is possible. Yeah, in theory one firm and 6 of its partners could be listed on page 1, but that’s the kind of thing that just doesn’t happen in practice. I’ve certainly never seen it, at least. I have seen GP results that are relatively cornered by 3 listings affiliated with each other, but I don’t have any screenshots on-hand. It’s possible to get that in relatively uncompetitive local markets, but in a semi- competitive vertical it’s a long shot. Will it help to increase SEO for a Google+/Pages listing if the phone number is actually IN that city as opposed to just having the same area code? For example, the (248) area code covers many cities in the Metro Detroit area, but if I were trying to use a 248# that was from the city of TROY for a listing in ROCHESTER (adjacent), or for another city in Metro Detroit, then would that possibly hurt my rankings a bit because the phone # isn’t entirely from the right city? Excellent question. I’ve actually wondered about that one. The short answer is I don’t know. The longer answer is I think it would be extremely hard to test or even notice a pattern as to whether businesses with in-town phone numbers generally have a ranking advantage (or vice versa). We do know that Google takes your geography – i.e. a more “central” location – into account. So *generally* (emphasis on “generally”) the businesses with in-town phone numbers will outrank the others. Whether that has anything to do with their phone numbers or is purely due to their locations is beyond me. Despite all that I don’t know, what I do know is that a ton of businesses – including many of my clients – use a cell phone number as their main number. They don’t seem to take a hit in the least for having done so. Phone numbers vary so widely that I don’t think Google is too hung-up on them (pardon the pun). As long as you’re located where you say you are, that’s a good UX. It’s similar with phone numbers: as long as you’re not piping people through a call center, the UX is probably good. The bottom line is I don’t think using a suburban phone number will affect your ability to get visible in Detroit. I’d say go with whatever number, as long as it’s local. Rather, your address will be the main thing that matters.